The Dreamer by Pam Munoz Ryan, illustrated by Peter Sis. Grades 4-8. Scholastic Press, 2010. 372 pages. Review copy provided by publisher. Neftali is a boy who sees beauty and intrigue in ordinary things. Raindrops become music, plinking on the zinc roof. A beetle on a tree is a jewel of the forest. An abandoned boot carries with it infinite stories of where it might have walked. But although Neftali has a gift of putting words down on paper, his father will not tolerate this "foolishness". Can he, who is sometimes too weak and sickly to get out of bed, stand up to his father? Stand up for his dreams? The Dreamer is a story about a boy who couldn't give up his way of seeing the world. A boy who became one of the most well-known and influential writers of his generation. A boy who became the poet Pablo Neruda. Everything in this book comes together to create something that's much bigger than the sum of its parts. 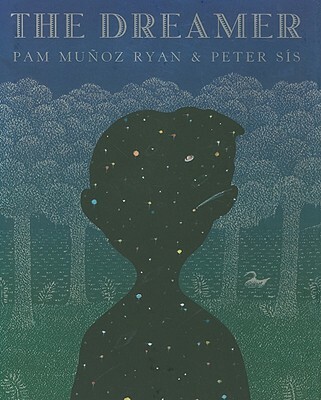 Pam Munoz Ryan's prose is fittingly poetic. She describes Neftali's Chilean home so that not only did I feel like I was there, but I felt like I was seeing everything through Neftali's eyes. I could see the beauty that he saw all around him. Ms. Ryan has obviously done her research and this book was crafted with care, right down to the green ink in which it was printed (Pablo Neruda wrote in green ink, which he felt was the color of esperanza - hope). Pair that expressive writing with Peter Sis's evocative illustrations and you've really got something special. Whether illustrating Neftali's flights of imagination or the overwhelming emotions he's feeling throughout the book, Mr. Sis's illustrations add greatly to the overall feel of the book. This is a fictionalized account of Neruda's childhood and Ms. Ryan includes an author's note with biographical information about the poet. She also includes several pages of Neruda's poetry to give readers a taste of the man's writing. This is an excellent choice for units on poetry. Not only does it lend itself to a study of Pablo Neruda, the vibrant imagery will inspire young writers to pen their own verses. I also think this would make an excellent classroom readaloud (but be sure not to miss the illustrations!). Some kids will need scaffolding with this one, but bright young writers prone to flights of fancy will devour this and be inspired. Oh, Newbery Committee, I'm so disappointed that this one didn't make the cut (although it The Dreamer did win the Pura Belpre Medal and was named an ALA Notable Children's Book). Read more reviews at Biblio File, Literate Lives, and Reading in Color. The Dreamer is on shelves now!